So far, the domestic demand for talc is increasing, and the market prospect is promising. There is also a growing demand for talc-milled talc mills. Since the invention of papermaking by Cai Lun in the Eastern Han Dynasty, after years of development and evolution, the achievements of the current papermaking process have been made. In today’s papermaking process, talcum powder is popular as a filler, but different papers for talcum powder. The fineness and whiteness also have certain requirements. The improper proportion of the combination will also have an impact. What factors determine the whiteness and fineness of the talc powder? The mill is the most important factor. Talc is ultimately applied in powder form. The processing technology required for talc processing is fine grinding and ultra-fine grinding. Therefore, choosing the right grinding equipment is essential to improve the unfavorable situation. The talc powder is generally required to have a fineness requirement for paper-making fillers. The fineness of the material should reach 300 mesh, and the whiteness requirement is above 90%, which satisfies the needs of these papermaking processes, and the required grinding equipment must have the strength of the finished product. 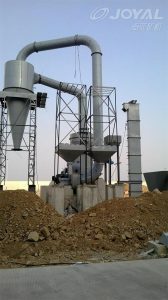 To meet the 300-degree fineness requirement, Shanghai Joyal‘s existing Raymond mill and vertical mill can meet the high problem of the product’s particle size. The specific type of mill needs to be more user-friendly for the production of talcum powder. Manufacturers that only provide talcum powder for paper mills can choose general small-sized milling equipment according to the situation. If there are many suppliers and large demand, large-scale milling machine can be selected for production and processing. The reason why talcum powder is trusted in the papermaking process is because it has the characteristics of dry slip, low hardness, high melting point, etc., and its chemical properties are stable. Adding to paper to make filler can improve the uniformity, gloss and smoothness of paper. The technology of printing and writing performance of paper is greatly improved, and the papermaking process is more practical. Therefore, talcum powder is widely used in papermaking technology, especially tissue paper production. In addition to being used as a filler in the papermaking process, talc powder is also used in chemical, ceramic, rubber, cable, paint and other processes. The marketing of talc powder manufacturers can be expanded, and talc powder of different quality levels can also be obtained. designation.